I read this book using Safari Books Online web site and Firefox 5. In my new position as a user experience designer I have the need to create flows, diagrams, wireframes, and mockups very quickly while keeping them attractive and polished. I have chosen OmniGraffle as my tool to do all of this and have been very happy with my choice. “OmniGraffle 5 Diagramming Essentials” is a good place to learn the ins and outs of OmniGraffle and includes many of the hidden treasures that make the software easy to use. It includes everything you need to know to create great looking diagrams and wireframes quickly. I found the coverage of keyboard shortcuts to be very helpful in laying out flows and diagrams very quickly, it is something I think I will use a lot. If a picture is worth a thousand words, why settle for anything less? Creating good visualizations to substantiate your ideas is essential in today’s corporate environment. Use OmniGraffle’s remarkably powerful and flexible features to get your diagrams right. Although fun to use, it can get cumbersome to find out exactly how to get what you want. I rate this book a 7 out of 10 and recommend it for anyone using OmniGraffle. If you have been using OmniGraffle for a while you may not get a lot out of it, but I recommend giving it a skim if you get the chance. This is a collection of short stories published in 1959 that I listened to as an audiobook. I found these stories to be kind of slow and mediocre. Maybe if I had listened to them in 1959 my opinion would be very different, but listening to them now they do not come across like they were written by a writer as great as Robert Heinlein. If you are a time travel fan the story “By His Bootstraps” is a must read. 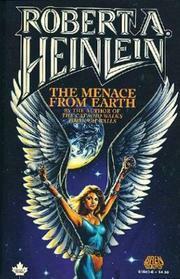 I recommend this book only to Heinlein fans and rate it a 4 out of 10. 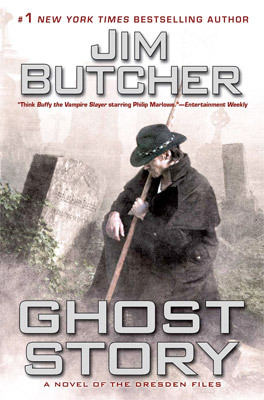 Recently a book that I had been eagerly anticipating, “Dresden Files Book 13: Ghost Story” by Jim Butcher, was published and I immediately jumped over to Audible.com to buy the audio book. Just before clicking the “Add to Cart” button I noticed that the customer reviews for the book were really low. Surprised by this I started reading the reviews and found out that James Marster’s was not the narrator. WOW!!! How could that happen? James Marster’s IS Harry Dresden. I cannot imagine anyone else living up to the incredible job that he has done narrating and acting the first 12 books and “Side Jobs”. Based on the reviews I decided that I did not want to hear even a sampling of the new guy and decided to buy the book and read it instead of listen to it. After some thinking I decided to buy it as an ebook from Amazon to be read with the Kindle software on the iPhone 3GS, iPad 1, and various Apple laptops. Even though the price of $14.99 feels REALLY high to me for an ebook especially when the hardback is only a dollar more I bought it anyways. The book was delivered to my iPhone very quickly and I was able to start reading in a matter of minutes. But, the font on the iPhone Kindle app is a terrible serif font that you cannot change to any other font. Every study ever done on the readability of text on a backlit computer screen has found that a sans-serif font like Helvetica, Arial, or Verdana is much easier and faster to read. I am not sure why, but the font made the book unreadable to me. Then I noticed that the text was being fully justified so that the spacing between words is different on every line. I am unable to create a rhythm in my reading because my eyes have to jump a different amount between every word. That plus the font issue makes reading a chore. A co-worker pointed out to me that Amazon has refurbished Kindle’s available for $99 so I decided that owning a Kindle was an experience I needed to have. A few clicks and 24 hours later the ninja UPS guy who never knocks dropped it off. After an easy setup that required plugging the Kindle into a computer and registering it then leaving the Kindle alone for 3 or more hours to charge I was ready to read with it. The device itself is nice and solid, the buttons give a decent amount of feedback when pushed, and the screen has enough contrast to be easy on the eyes. I can choose from multiple fonts which include a sans serif one, I can change the spacing between lines of text, but I still cannot change the justification to be left aligned. Reading on the Kindle is a decent experience; with its reflective screen it causes noticeably less eyestrain than the iPhone, iPad, or laptop screen, and when dropped into a Ziploc freezer bag it is comfortable to read from in the bathtub. The battery life is great, the selection of books is great, support for Audible is cool, and being able to listen to MP3s while reading is neat. I find the device to be so thin that it is uncomfortable to hold, that the locations of the back and forward buttons still confuse me after reading a novel, the keyboard is tough to type on when playing word games, the web browser does not handle very many web sites well, and it is yet another device to drag around and worry about losing or breaking. 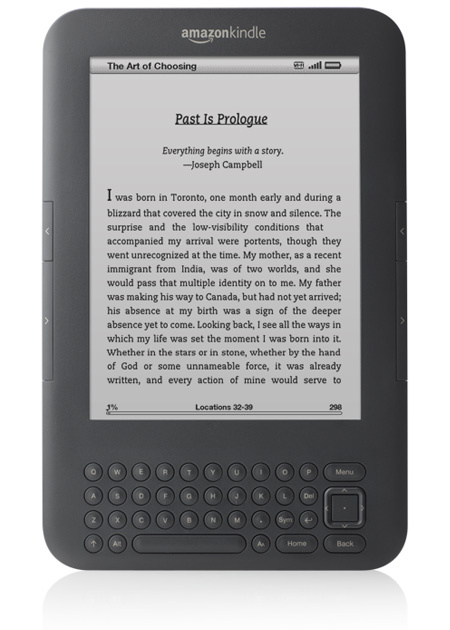 I doubt I will keep the Kindle; I will be giving it to someone as a gift unless my wife falls in love with it. I will continue to read ebooks using eReader on the iPhone and iPad as it allows a lot more customization than the Kindle app. I rate the Kindle a 7 out of 10 and thing it is good for someone interested in ebooks and not in gadgets. I read this book on a Kindle. There will be a review next week of the process I went through in deciding to buy a Kindle and what I think about it. It feels like I was waiting for this book for a very long time. When I last saw Harry he was in big trouble. I think the previous book, “Changes”, is one of the best Dresden books and it ended with a real cliffhanger. “Ghost Story” disappointed me a little bit, I felt like I knew what was coming next throughout the entire story. I was wrong a couple of times, which was nice, but most of the time the story unfolded exactly how I thought it would with very few surprises. I enjoyed the book and am looking forward to the next one but it did not reach me the way many of the other books in the series did. I rate this book a 7 out of 10. If you are a Dresden Files fan you will read this book, if not then you should begin with Book 1: Storm Front. I listened to this book as an audiobook. 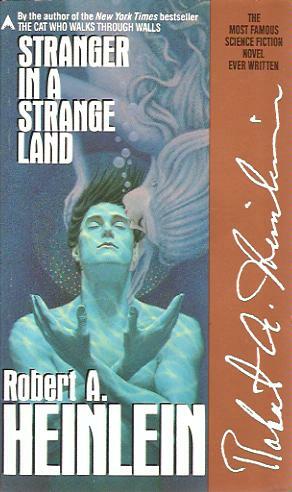 Published in 1961, Stranger in a Strange land is one of science fiction’s most influential stories. It tells the story of Valentine Michael Smith born during the first manned mission to Mars and the only survivor. He grows up on Mars where he is learns to be a Martian and does not learn how to be an earthling. Over the length of the story Michael learns what it means to be an earthling and what it means to human. It is such a great story of growth and change. There are a lot of elements in this story that have shaped the science fiction we know today. From terminology like “grokking” to ideas like “sharing water” this story is one of the most important science fiction stories ever written. I rate this book a 10 out of 10. Not so much because it is masterfully written or a story that I want to re-read but because of the influence it has had on science fiction and our culture.